I moved apartments over the weekend, and in the great push to clean out the old place in anticipation of the new, I decided to finally do away with a set of (free at the time) dining chairs that I'd never really cared for. Better yet, I came across an architecture office that has closed down and was looking to sell off a rash of cantalievered Marcel Breuer B32 chairs. 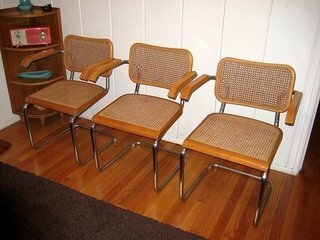 I scored a handsome quartet of vintage seats but wanted to learn more about them. 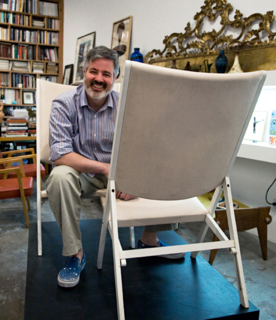 I turned to LA gallerist and walking design encyclopedia Sam Kaufman for a history lesson, and to learn how to tell if my seats are authentic. Oh the lesson I received. One could say that the long story of Marcel Breuer's B32 ("Cesca") chair has been characterized since the beginning by the issue of authenticity. The first of these questions: who was the true inventor of the steel-tube cantilever chair? It was actually Mart Stam -- the avant-garde Dutch architect -- and not Marcel Breuer who first designed a simple chair with such a structure. Breuer's landmark steel-tube B3 ("Wassily") chair of 1925, a design breakthrough, may have inspired Stam, but Stam's 1926 steel-tube cantilever chair, though crude by comparison to Breuer's slightly later one, was the originator of the type. There was a big legal battle at the time over which one of them came up with the idea first, and Stam won. This is why Breuer's chair was never patented. Authenticity would seem to call for only one manufacturer, among the sea of companies that have made and continue to make this extremely popular design, to be the maker of authentic examples. But there have been no less than three official manufacturers of the chair. 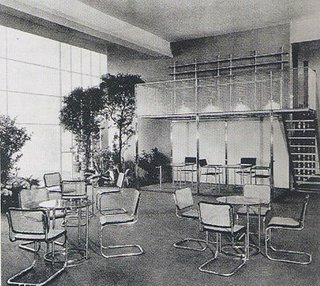 The first was Thonet, starting in 1927. Then in the 1950s, Gavina started making them with Breuer's blessing and participation (the Italian company was the first to name the chair the "Cesca", after Breuer's daughter, Francesca). In the 1960s, Gavina was bought by Knoll, who are today considered to be the only makers of authentic "Cesca" chairs. Here's Sam Kaufman in his eponymous LA gallery. Photo by Shannon Donnelly. There is no question that the Knoll version of this chair is of obviously better quality than many, though not all, of the many knock-offs. Knoll "Cesca" chairs which lack a label cannot be easily identified with certainty by someone who has not had the experience of handling many "Cescas", genuine and not, over the years. But there are details to look out for, which mark a better "Cesca" from a lesser one. Start by looking at the seat: does the front edge of the wooden seat frame stick out a bit? On a Knoll chair, the seat curves down slightly with the downward sweep of the tubing. Next, look at the tube-ends, which should be continuous with the tubes (no seam between tube and cap). Then look at the bends in the tubing: does the tube flatten out a bit as it curves, or does the tubing retain a constant radius? Preventing metal tubing from flattening as it is bent requires the use of mandrels, not bothered with by most of the imitators. All of these rules for authenticity have exceptions, given that there have been more than one maker of authentic "Cesca" chairs. I once had a pair of very early (1928) Thonet B33 chairs, which I sold to a gentleman in Europe. The B33 is like the B32 / "Cesca", but with canvas-sling seating surfaces instead of caning and wood. A 100% original 1928 Thonet B33 is about as authentic as it gets, but these chairs had bends in the tubing which were closer in appearance to a knock-off than a Knoll. "Made in Italy" stickers carry little meaning by themselves. Gavina was an Italian company, and Knoll has made these chairs in Italy for years (though perhaps not exclusively in Italy). The "Cesca" chair, like many other pre-war design icons from the first generation of modernism, is much more commonly encountered as a knock-off (often a rather sloppy knock-off) than as the real thing. Post-war, second generation modernist design -- midcentury modernism -- was more American than European, and more mass-produced from the start, so authentic vintage examples were always relatively easy to get a hold of, compared to authentic Breuer, Le Corbusier, and Mies stuff.